Recently I was lucky enough to be invited to a Mommy Blogging event, where all attendees were picked to "test drive" and review the all new Graco SnugRide Click Connect 40 car seat. In the material I was given, along with the car seat, the SnugRide 40 (as I will now refer to it) is marketed as "the only infant car seat that provides rear-facing protection for babies from birth to 2 years old, as recommended by the American Academy of Pediatrics." This car seat is meant to grow with babies from four to 40 pounds so, "parents can keep their children rear facing longer, while making sure they stay comfortable as they grow." How does it "grow" you ask? Well the car seat is able to slide back on the base, putting the child further away from the seat back, to give the child more leg room as she grows. As a mother who breeds freakishly tall and skinny kids (thanks to my almost seven foot tall, very slender husband and my 5' 9" self - notice I did not mention slender) I was immediately a skeptic. Our oldest daughter was out of the infant car seat we had for her around 8 months old as she had already reached the height limit. And now at almost 3 years old she is only 32 pounds. How would I have any use for a infant car seat that could keep my youngest daughter (who is in the 99 percentile for height already at 11 weeks old) in it until she was 2? And what child would need the weight limit of 40 pounds in an infant car seat? First impressions...right when I took it out of the box I felt like this sucker was huge. But when I put the SnugRide 40 next to the older Graco SnugRide 30 (purchased in 2009) it is in fact a tad smaller (and lighter). What made it seem huge was the large base that it was attached to (see above photo). My initial thought was "there is no way this is fitting in our backseat," as with the SnugRide 30 installed behind the passenger seat, we have to put the front passenger seat up further than we would like in order to accomodate the car seat and base. And we drive a 2010 Toyota Highlander, which is a mid-sized SUV. My first order of biz was to install the SnugRide 40 into the car myself to see if I was right about it being too big. Right away I noticed some pretty awesome features on the base alone. The latch system straps are stored in a little compartment on the underside of the base, that actually has a door on it so they can be put away when not in use and not flap around like most car seats. One of my pet peeves about the Britax Boulevard toddler car seat we have (which I LOATHE by the way - more on that in a separate post) is that when we are toting it through the airport the straps are flapping around and dragging on the floor, so this little strap compartment is a huge deal for me! I also love that there is an extendable foot pad type thing so that your kids aren't kicking the front of the seat and getting it all dirty. Ah the little things that get a Mama excited. seat from current position. In #1 setting. So with the base installed I clicked the SnugRide 40 in place at the closest setting (#1 out of 8 position settings). I left the front seat where we currently have it when we use the SnugRide 30, and you can see (in photo at right) that the SnugRide 40 just fits with little room to spare. I can sit comfortably in the passenger seat like this, but I noticed that my father (at 6') had his knees right up to the dashboard with the seat in this position. I was able to slide the car seat back to setting #3 without having to move the front seat, but at #3 it is jammed against the front passenger seat back. In order to reach the car seats full potential, and slide it all the way back to the tallest setting, I have to move the passenger seat up so far that my knees are jammed into the dashboard. As I said, I am a tall person at 5' 9" and I want to be comfortable in my own car, so this definitely won't work for us. The furthest we would be able to push the car seat back, with me sitting comfortably in the front seat, would be to setting #3. Again, that is in our family situation, with our current car, a Highlander. If we had a bigger backseat, and a bigger car, this wouldn't be an issue. Or if the car seat was installed in the center of the backseat I don't think this would be an issue either. So on to the car seat itself. Visually it is the best looking car seat on the market if you ask me. It comes in two color options, Mena (pink) and Moonstruck (gray). I received the pink version, and have yet to see the gray in person. The pattern on the seat it a lovely, on-trend, pink damask and is featured on the removable baby inserts as well as the awning/visor. This was perfect for us, as we have two little girly girls at home. The fabric is an easy wipe fabric, as opposed to the soft cloth of the SnugRide 30. This is perfect for my "happy spitter" baby! I can't tell you how many times I have had to take the cover off the SnugRide 30 to throw it in the wash, and it is no easy feat, especially to put it back on. One huge plus of this car seat is that it comes with the Simply Safe Adjust harness system that allows parents to adjust the harness and headrest with just one hand to fit their baby's height as the baby grows, all without having to rethread the harness for extra convenience. This is an incredible feature, and a huge selling point for the car seat. The SnugRide 40 also comes with much more side head support for infants. If you look at the photo of the two car seats side by side (above) you will see that in addition to the removable infant insert, there are permanent side-flaps to protect baby/toddlers head while in the seat. One of the features that I am not to keen on is the fact that the sun visor is attached to the car seat with velcro. When in the car, I find myself adjusting the sun visor of the SnugRide 30 pretty frequently on sunny days so that the sun is not in my daughter's face. Since on the SnugRide 30 it isn't attached, I am easily able to just put my hand back and move it all around. In the SnugRide 40, the sun visor is attached and in order to move it like I do with my current car seat (meaning positioning it in front of her face) I would have to un-velcro the visor, and force it over the back of the seat. It isn't hard to do this when you are out of the car and in front of the car seat, but while driving it is nearly impossible. I also found that the baby was much more reclined in this car seat, which is nice when they are young, like my 11 week old, but compared to my Britax Boulevard toddler seat, the SnugRide 40 has the child practically laying down. I can't imagine my older daughter having been in that position when she was over a year old. Sure this one can be easily removed, but with the weight of the car seat, and the weight of you 40 pound child, are you really going to carry them around in the car seat? 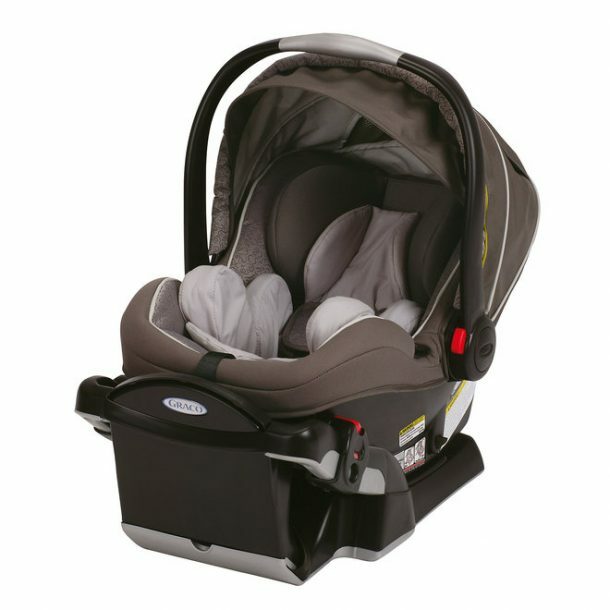 In summary, the Graco SnugRide Click Connect 40 is a pretty amazing piece of equipment, but isn't the right car seat for my family and our current car. With a price tag of $219.00 it is priced on the high end of infant car seats on the market. As a mother who knows that her kids will max out height limits on car seats way before weight limits, this wouldn't be the right choice for my family. If I knew that my kids would be average height and weight, I would definitely consider purchasing this for my family. And if we had a different car! I absolutely love this seat! The amount of leg room is amazing - what genius idea to make the base have so many recline levels. Love the no-thread harness adjuster too. I like that it felt lighter than the OnBoard 35 Air and would love the SnugRide 40 for our next little one. systems, but the last one was 7 years ago. My kids have this on their registry, but at $400 for two pieces, is it really worth the high dollar figure? Wow, nice specs for a baby seat (just look at all the leg room)! I suppose car companies can tie themselves up with the makers of these seats and have them bundled in with their next car deal. I can't seem to find the height limit anyway for this seat!! Was it listed in the specs they gave you? I have this car seat and let me tell you, it's a terrible piece of equipment for anyone with a smaller car, or even with a taller car (we have a Tahoe). With the baby in the car seat, it's nearly impossible to lift the seat out of the base, you have to squeeze the life out of the red button at the top and lift with all your might. This car seat is REALLY heavy. I am on the shorter side, so it's terribly awkward for me to carry my son anywhere because the car seat weights a ridiculous amount as it is without my son it in. I probably look silly trying to a) get him out of the car and b) carry him into the places we are going. My husband even struggles to lift him out of he base and he is 6 foot, and does physical labor for a living. This is an expensive car seat so save your money and get a cheaper one that is easier to use. This car seat is great. I have a very tall toddler who just turned 2 and he still fits. I wish I knew about this seat before. Smaller kids really can ride in it rear facing longer! Bravo Graco! I have two of these. Love them! Yes, they are heavy, yes they are big, but I have a van so this makes up for it. I usually take the baby out of the car seat anyway when I go places, unless it is to set into a stroller. I have a tiny medical baby, that will be 3 in December. She only weighs 19 lbs and will be in this car seat for sometime. Thank goodness! Lots of leg room and head rest adjusts. This is an extremely well built car seat that will last her well.